Pretty much all the emotions that a person can have are either like sweet remedies or poisonous matter... Wouldn't it be good to perform an Emotional Detox fom time to time by applying simple yet effective tools to get rid off all the negative emotions and learn how to increase, boost and summon the positive ones? Niko Goranovic a.k.a. the Life Strategist is a Neurolinguistic Programming (NLP) trainer, performance coach and the co-creator of REM Induction Therapy method. In this session, Nikola will present Emotional Detox - a set of self-coaching tools that we will be able to take away, practise on a regular basis and also share with our family, friends or colleagues... Let's learn how to spread the positive energy! Making a personal collage mandala is a dance between the conscious and unconscious. It is a simple and profound way of revealing and understanding your life journey right now in the present. By the time you’ve finished your mandala you’re in a different place and another moment. Your mandala gives you messages, indications, resources to take, absorb and integrate for yourself bringing awareness, focus and affirming to your life. Kate Collier is an experienced therapeutic counsellor and systemic / identity constellations facilitator. Kate will talk about her experience of mandala making, mandalas for different purposes and the 5 step collage mandala making process she's developed. Kate has run mandala-making days for ten years now in the UK and the USA amongst friends, in workshops and in a prison. She sees these as Mandala Constellations. The Hove StressBusters Team is looking forward to welcoming you all to this exciting event! You can still pay on the door, but we have now introduced the online booking option too, to help speed up the registration, giving us all more time for stress busting! 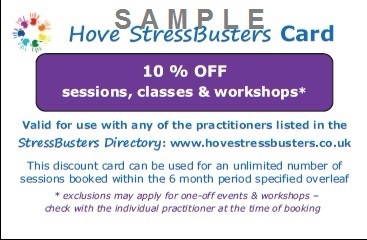 The StressBusters card is available for purchase on the door - costs £15, it's valid for 6 months from the day of purchase, and entitles the holder to 4 FREE talk & demonstration evenings (usually £5 each), 10% OFF all classes and treatments with any of the practitioners listed in the StressBusters Directory as well as any treatment at Equilibrium Pain Management Clinic, and priority booking & special offers for StressBusters workshops and courses.